As we saw in the last post, Milt Caniff had to tap dance ever so slightly around the issues of Japanese and German aggression in his comic strip. Meanwhile, on the radio, something very similar was going on. Superman began life in Action Comics in 1938, but his immediate and extraordinary popularity bounced him into other media almost without pause. He showed up on radio in February of 1941--The Adventures of Superman was one of the best children's serials of that decade and is still fun to listen to today. A storyline broadcast in 1941--but still well before the attack on Peal Harbor brought us into the war--featured Superman going up against a gang of foriegn saboteurs. The spies are identified as anti-British and speak with obvious German accents, but are never actually refered to as Germans or Nazis. The show was doing the same tap dance Caniff was doing--taking sides in the war while avoiding the ire of any radio station owners with isolationist leanings. In fact, at one point in the story, Daily Planet editor Perry White is captured by the foriegn agents. In what is, in retrospect, an absolutely wonderful moment, Perry starts to call his captors "dirty Nazis," but he only gets as far as "Dirty N..." before he's slapped and told to shut up. As with Terry and the Pirates, Superman was able to overtly identify the villains as Axis agents once we were officially at war. In fact, the Nazis remained the bad guys for a while even after the war ended. In an extended (and truly excellent) story line that ran in late 1945, a German scientist injects a fanatical Nazi with liquid Kryptonite, giving him powers that threaten even the Man of Steel. Caniff and the creative staff of The Adventures of Superman were all pretty cool guys, willing to take a stand for their beliefs. That they had to "cheat" a little in their storytelling to do this does not speak ill of them at all--they were simply taking advantage of the only route open to them to make an important point about the dangers of Nazism and of Japanese aggression. If you own your own movie studio, though, you have a lot more freedom about saying whatever the heck you want. Harry Warner--head of Warner Bros. studios-was increasingly concerned with Nazi Germany throughout the 1930s. In 1939, he began to reflect this concern in his movies. Confessions of a Nazi Spy, starring Edward G. Robinson, was released that year--a good six months before Germany invaded Poland. Loosely based on a real-life spy trial, it was fervently anti-Nazi. Warner took a lot of heat for that movie. Several of his European-born stars, including Marlene Dietrich, had to decline to appear in it because they feared retaliation against relatives still living in Europe. The German government lodged an official protest and a number of Latin American countries banned the film outright. The Warner brothers eventually landed in front of a Senate committee investigating "propaganda" and "war mongering" in movies. The Warners basically replied "Well, duh!" to these charges, reminding the committee that the movie was, after all, based on a true story. Then they went home and made more anti-Nazi pictures. The Warners weren't alone in their overt depictions of the Nazis as villains in those last few years before we entered the war. Over at Timely (later Marvel) Comics, several of those new-fangled superheroes were doing their share of fascist-bashing. We'll take a look at this in the last post of this series. Over the course of the 1930s, the Nazis had gained power in Germany and the Japanese had invaded China (which was already being torn apart by civil war). Another World War seemed more and more likely as the decade neared its end. In the United States, the thought of war understandable frightened many people--the horrors of trench warfare were still very fresh in the collective consciousness. Many, though, recognized the threat fascism presented--they felt the sooner we dealt with it, the better. Others were staunch isolationists. Europe and Asia might be awash in blood, but the U.S. (protected by wide oceans on both sides) could and should remain neutral. So how did those producing popular entertainment deal with all this? 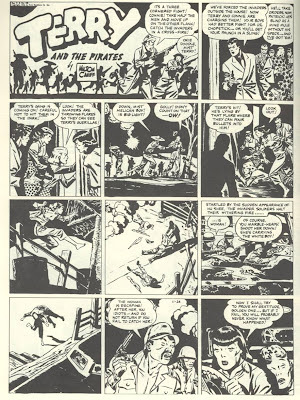 A look at Milt Caniff's classic adventure comic strip Terry and the Pirates tells us a lot. Terry is, in my opinion, the finest adventure strip ever done. During the 1930s, the size of the daily newspaper strip was noticably larger than it is today. On Sundays, strips were given either a full page or a half page each. This allowed for detailed art work, more dialogue and (consequently) complex and satisfying storylines. Caniff's strip took place in and around China, where young Terry Lee and his mentor Pat Ryan bummed about that part of the world, encountering bandits, rebels, smugglers and pirates. Indepth characterizations, strong plots, great action and wonderful art lifted the strip into classic status almost as soon as it first appeared. Inevitably, Caniff ended up doing stories dealing with the Japanese invasion of China, in which he presented the Japanaese as the bad guys. But--to avoid any chance of newspaper editors with isolationist feelings from cancelling the strip--he never actually refers to the invaders as the Japanese. Despite drawing their uniforms and equipment accurately and making it clear to anyone who ever glanced at a newspaper headline that they were Japanese, they are consistently referred to as the "invaders" in the strip. 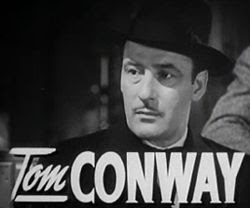 When Britain and Germany went to war, he even did a storyline involving an unnamed, anti-British nation that was working to destroy British ships in the Pacific (until Terry and his friends helped foil their plot, of course). Eventually, the company that syndicated Caniff's strip did ask him to back away from stories implicitly about the Japanese and Germans. Caniff agreed, but then Pearl Harbor was bombed and it didn't matter anymore. Terry joined the Army Air Corps and there was no longer any problem with identifying the Japanese 0r the Germans as the enemy. But did everyone tip-toe around these issues during the 1930s? Some did, but others had their fictional creations face off against the Nazis without any qualms at all about neutrality or isolationism. I'll do one or two more posts on this subject, in which we'll look at several Warner Brothers films, the Superman radio show and Timely (later Marvel) comics. 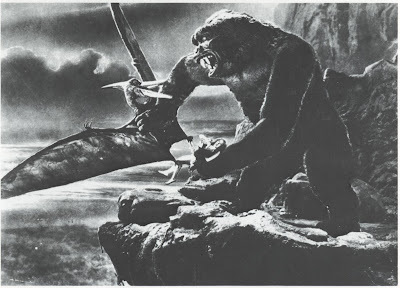 The original King Kong (1933) wasn't trying to be an epic. It just kinda turned out that way. With Willis O'Brien's wonderful stop-motion animation giving the movie backbone and heart, this fairly straightforward adventure story is perhaps the single most entertaining and entrancing film ever made. Everyone knows the plot--or if you don't, you should be taken outside and shot. A filmmaker named Carl Denham, famous for shooting jungle pictures on location, sponsors a trip to a previously undiscovered island. He isn't sure what might be there at first--but he's pretty sure it'll look good on film. Boy, was he ever right. Not that he gets a chance to do much photography. He and Jack Driscoll (first mate of the ship that brought them to the island) are soon hip deep in dinosaurs, desperately trying to save leading lady Ann Darrow from the clutches of a giant ape named Kong. 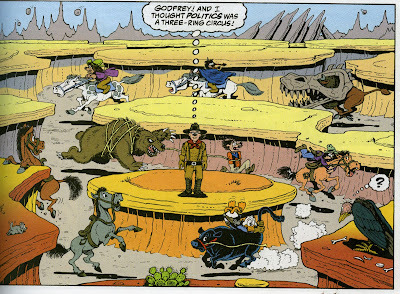 The two heroes (along with a rapidly shrinking group of sailors) encounter a stegasaurus and a brontosaurus before Kong knocks most of them into a pit. 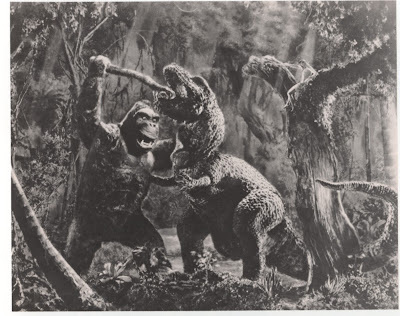 Kong himself then battles--in rapid succession--a tyrannosaur, an elasmosaur and a pteradactyl. 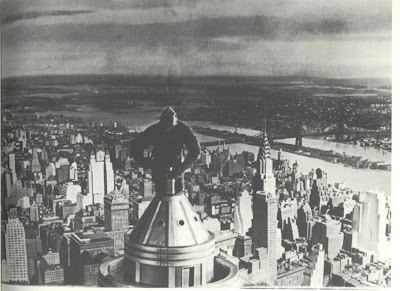 Eventually, the big ape is gassed unconcious and brought back to New York for exhibit. That proves to be a very bad idea. The special effects are backed up by strong direction and photography. The dinosaur stuff is so much fun it makes your toes curl--especially Kong's classic fight against the T-Rex. It's interesting to compare the original film to Peter Jackson's 2005 remake. (We will, of course, pretend the 1976 remake does not exist.) 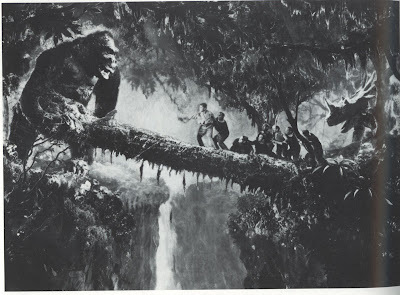 The 1933 film sets out to be a simple (in terms of story and theme) adventure film. It was done so well it became an epic story on its own merits. Jackson (a brilliant filmmaker who did a great job with Lord of the Rings) tries to make an epic and largely fails. His King Kong demonstrates that CGI special effects can be a work of art (Skull Island looks fantastic), but he practically beats us over the head with the idea that we are supposed to be sympathetic to Kong, rather than trusting to the story to make this point. He adds a number of unnecessary characters and the film as a whole runs far too long. And he jiggles the stupid camera all over the place during Kong's fight with a couple of big carnosaurs, so you can't really follow the action. NOTE TO ALL CONTEMPORARY FILMMAKERS: HOLD THE CAMERA STEADY!!!!!!!!!! So its the original film that is still the true classic. It's still the best darn dinosaur film ever. 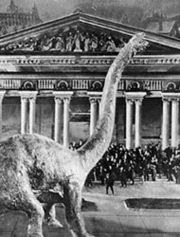 The 1925 movie adaptation of Arthur Conan Doyle's movie The Lost World is unabashedly in love with its dinosaurs. And, by golly, it should be. 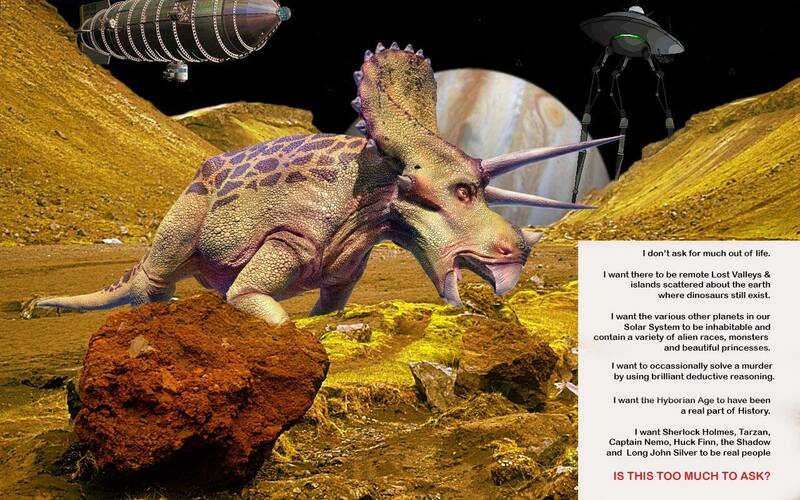 The story is the prototype of all the future "lost world" books and films. A group of explorers discover a remote area (in this case--a nearly inaccessible plateau in the South Amercian jungle) in which dinosaurs and other prehistoric creatures have survived. In the book, the expedition reaches the plateau, has a run in with one or two dinosaurs, then gets involved in a genocidal war between a tribe of Indians and a tribe of primitive cavemen. It's a great story, highlighed by the wonderful character of the cantakerous Professor Challenger, who heads up the expedition. But the movie opts to reduce the Indian/caveman war to an appearance by one ill-tempered apeman, thus leaving more time for more dinosaurs. With Willis O'Brien, the pioneer of stop-motion animation, heading up the special effects, this is exactly the right decision. O'Brien and Marcel Delgado (who built the models) do a wonderful job of bringing extinct creatures back to life and giving them personality. Again and again, the movie breaks away from the human characters just to show a few more minutes of dinosaurs battling one another. Towards the end of the film, a volcano erupts and there's a massive dinosaur stampede that is as delightful to watch today as it was 83 years ago. 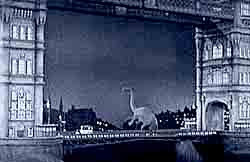 The finale, in which a brontosaurus brought back to civilization escapes and rampages through London, was the start of a long and honorable tradition of movie monsters destroying a modern metropolis. 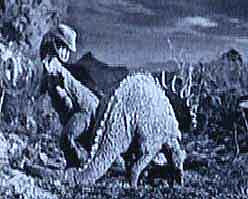 In fact, the dinosaurs easily outshine the human actors. Due to some poor editing when the movie was originally released (exasperated by some footage being lost over the years), the actual story has some narrative and pacing problems. All the same, Wallace Berry is excellent as Professor Challenger and the remaining actors do a fine job with their roles. But it will always be the dinosaurs that are the most important element of this movie. In 1925, stop-motion was still a new technology. In fact, when Arthur Conan Doyle showed the film to a group of stage magicians (including Harry Houdini), nobody could figure out how the special effects were done. Somebody even suggested the filmmakers must have found live dinosaurs somewhere. Nowadays, with all of us spoiled by modern CGI effects, we're not fooled at all. And O'Brien's animation on The Lost World isn't quite as smooth as it would be 8 years later when he brought King Kong to life. But the movie is still fun to watch. Stop-motion has its own charm--a look and feel that brings the viewer more fully into a fantasy world than the "perfect" look of CGI can ever do. 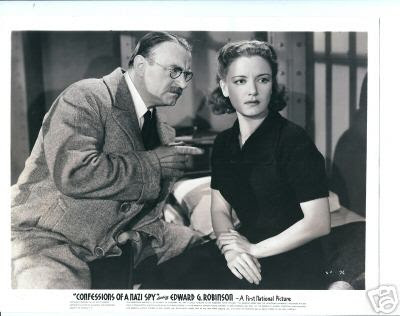 By 1941, George Sanders had starred as Simon Templer, aka the Saint, in five movies produced by RKO. These were fun films based on Leslie Charteris' classic "gentleman-adventurer" character, but Charteris eventually pulled the rights to the Saint away from that studio. So RKO turned to a short story by Michael Arlen titled "The Gay Falcon" to find another suave gentleman-adventurer that Sanders could play. In that story, the main character (who is 0bviously based on the Saint) is actually named Gay Falcon. An unfortunate name from a modern perspective, but of course his first name didn't have the same connotation then as it does now. The 1941 movie version does use a few plot elements from that story, but mostly just comes up with an original story. Though Sanders is now playing a guy named Gay Laurence, known as the Falcon from his work catching criminals, he is really a carbon copy of the Saint. The Falcon movies, though, are actually a little better written than those in the Saint series. The plots are better constructed and the comic relief (often a stumbling block in such film series) is actually pretty funny. After four films, Sanders left the series. Rather than recasting the part, though, the producers opted to do something unusual. In The Falcon's Brother (1942), Gay Laurence is killed off. His brother Tom takes over as the main character. The series continued for 10 more films. Whether the Falcon was played by Sanders or Conway, the appeal of the character was the same. He was an intelligent guy--upper class but never snobbish--who always kept his cool even when he was being framed for murder or was facing down an armed killer. Both Sanders and Conway gave the Falcon class, while the script writers gave him some solid, interesting mysteries to solve. 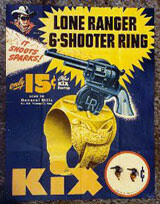 In 1944, the Lone Ranger radio show did a total of 16 episodes (scattered throughout their schedule during the first half of that year) in which the Ranger teamed up with or fought against various real-life figures. Most of them were personalities linked with the Old West, such as Buffalo Bill or John Wesley Hardin, but their was one particular team-up that was both really cool and really unusual. 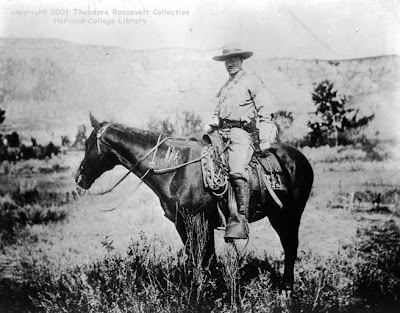 That was when the Lone Ranger ended up fighting aside future president Teddy Roosevelt. The two episodes featuring T.R. were broadcast in May of 1944. The first of these involved T.R. coming out west in 1881 to run a ranch he owns. Rustlers are planning on running off with the stock and part of their plan involves giving this "Eastern dude" such a scare when he gets off the train that he'll immediately run home. Roosevelt doesn't scare easy, though. Eventually, with the help of the Ranger and Tonto, he manages to round up the bad guys. Aside from being a well-told story (which was typical of the best of old-time radio), I think the episode does a reasonably good job of portraying Roosevelt as he really was. Besides, the idea of he and the Lone Ranger working together is just plain cool. The second episode was even better. A few years later, Butch Cassidy and the Hole-in-the-Wall gang steal some horses from Roosevelt's ranch while escaping after a train robbery. The Ranger is already on their trail. Roosevelt and his house guest--artist Frederick Remington--join him as they track Butch and his gang through a raging blizzard. The best part of this episode was probably at the climax, when the Ranger comes up with a way to use a Remington painting to trick the crooks into surrendering. One interesting side note--Harry Longabaugh is identified as a member of Butch's gang, but he's never referred to as the Sundance Kid. I suppose that particular nickname wasn't well-known until the Newman-Redford movie came out years later. And, boy, Butch is this episode is a lot more murderous than Paul Newman ever was. These episodes remind me of another great Roosevelt team-up: from Don Rosa's classic comic book miniseries "The Life and Times of Scrooge McDuck," in which we follow a young Scrooge from the time he was a poor shoe-shine boy until he makes his fortune and becomes the world's richest duck. It turns out that while Scrooge was punching cattle in 1882, he met up with Roosevelt. (The first of several meetings, we later learn.) Scrooge was tracking rustlers and Teddy comes along for the ride. It's a great story--Rosa emulates the great Carl Barks in his ability to use wonderful art and characterizations to tell a story that works as both a comedy and an adventure. This one ends with a wild chase through a canyon maze involving Scrooge, the cattle, the bad guys and a buffalo wearing a dinosaur skull. Teddy Roosevelt was--in my opinion--a great man and a great president. It's not surprising that he'd make a great partner for two of the best fictional characters ever created. The first Thin Man movie was made in 1934, starring William Powell as Nick Charles, a retired private detective who's now married to the wealthy and beautiful Nora. Nora, of course, is played by the impossibly beautiful Myrna Loy. Nick and Nora have, I think, an absolutely perfect relationship. They obviously simply enjoy one another's company; they're undeniably in love with each other; and (most importantly) they have a tendency to stumble over corpses on a regular basis. 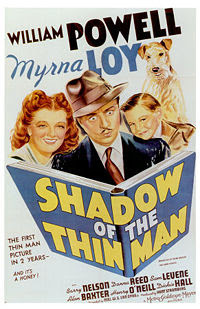 Over the course of the six Thin Man films, they get into the habit of stumbling over two or three corpses per movie. Nick then ends up using his admirable detective skills to figure out whodunit. William Powell brings a sense of both wit and intelligence to Nick Charles, who is just as much at home in the presence of crude street hoods as he is with the upper-class people his wife knows. But it's Myrna Loy as Nora who really makes these films shine. She's absolutely perfect in the role. In fact, I believe it is literally impossible for any man to watch the Thin Man movies and not fall madly in love with her. The actual plots are pretty good as well, giving the Charles' a chance to rub shoulders with both common riff-raff and social elite until Nick is ready to gather all the suspects together and reveal who the real killer is. These films are yet another example of the good basic storytelling skills inherent in the genre.